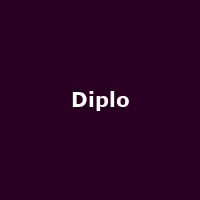 Diplo is a Grammy award-winning American electronica DJ and producer from Philadelphia who has also recorded under the name of Diplodocus and is a founder member of Major Lazer. His releases include the album "Florida", singles "Reload It" and "Make You Pop" and remixes for Kanye West, Bloc Party, Hot Chip, M.I.A. and Deerhunter. In 2015 he released the 2016 Grammy-winning album, "Jack Ü" along with Skrillex, followed by the 2019 collaborative EP: "Europa". In 2018, he formed "Silk City" along with Mark Ronson.